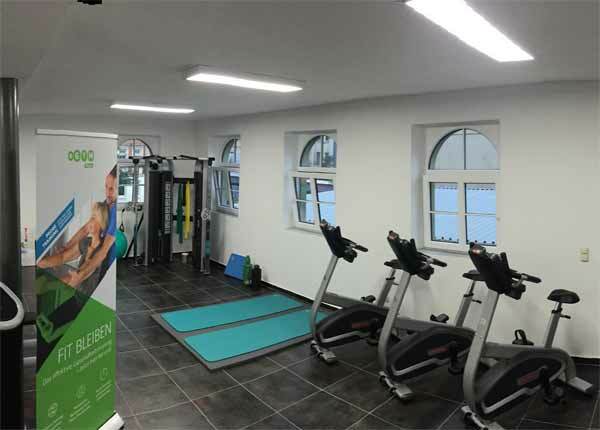 LED retrofitting at the fitness center for training Lindenau and the affiliated physiotherapy Lindenau in Leipzig. This studio has little in common with a classic gym. The owner Mr. Vogt uses the latest methods to individually increase strength and mobility. The training results are evaluated using state-of-the-art analysis methods. The LED lighting in the gym has been deliberately chosen in a bright and clear neutral white shade. Without appearing unpleasant and too cold. This increases activity and motivation. For this purpose we have used large LED ceiling lights measuring 120x30cm to achieve a neat and even illumination. In contrast to the studio area, we have equipped the corresponding physiotherapy Lindenau in a warm and relaxing colour tone with LED panels with very good colour rendering. For this we have used 30x30cm LED panels in warm white 3000K with a very good colour rendering of RA92. This creates a pleasant atmosphere for the patient during therapy sessions. The lighting concept of LED lighting complements each other just as well as an optimal combination of physiotherapy with accompanying strength and movement training, as shown by the many positive evaluations the studio has received. Visit the Center for Training Lindenau at Lützner Str. 92 in Leipzig / Germany.